Like Pinterest, Tumblr and Stumble Upon, Reddit is also a social bookmarking site but may be not a perfect fit for all type of marketers. But still Reddit has lots of capacity to become number #1 referral traffic source for your site. Reddit can drive instant and huge referral traffic to your website and also it is very simple to use. Today I will take you to all the insights of Reddit and will let you know how to use Reddit to drive massive traffic to your blog. Reddit is one of the top bookmarking sites and if you are on the front page of Reddit for just few minutes, you can expect millions of traffic instantly to your blog. Reddit calls itself the “Front page of Internet”. It was founded on 23rd June 2005 and yesterday Reddit celebrated their 10th Anniversary. Here you can submit your links and contents in one of the particular category which matches your content called SubReddit and other Reddit users will interact with your content by voting, commenting and sharing. This is how Reddit works. Below is what Reddit was after it went live way back in 2005 by its founders Steve and Alexis. Why you should Use Reddit? As per me the main use of Reddit is to drive huge traffic to your website. Reddit drives more than 150000k unique visitors each month and so you can estimate the potential of this bookmarking site. So it’s the stats of Reddit. The main question is how much it can send to your website? Well it completely depends on your link or content. How much famous your link is. The success of your link mainly depends upon the popularity of the content you’ve shared. Whenever you share any content on Reddit under any allowed subreddit, other Reddit users can either up-vote your content or down-vote. 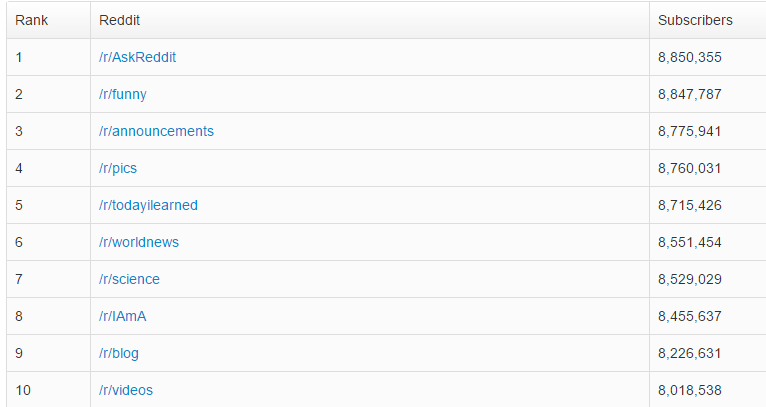 The number of up-votes you content will get the more is the chance to get visibility and hence traffic. Warning: Unlike Pinterest and Stumble upon taking wrong decision on Reddit can harm you a lot. On Pinterest and Stumble upon, if someone doesn’t like your content shared by you, they simply can ignore that and what you will lose is the money and time but the same does not only apply to Reddit. On Reddit, if you will do wrong thing, your name and status will also get destroyed. Because on Reddit if somebody will not like your content then they have an option to down-vote you and in addition to losing money, time you’ll also laughed and your status will be ruined out which is a huge loss for marketer. As per Neil Patel, if your subreddit has received 54 up-votes then you can expect traffic of around 61k. Which is huge, isn’t it? The most interesting thing about Reddit is, it doesn’t work on the influence like some sites do. No matter who you are, if you’ve good votes on the subreddit you have shared, you can reach to the front page. Submitting your content on Reddit is too easy. Just create an account on Reddit. Once signed up, login to your account. Here at the right top you will find options to submit link/posts etc. If you want to submit just link of any of your blog post or website, click on “Submit New Link” and it will open a new page for you where you have to fill the required details. Here in this form you’ve to submit the details. At the top of the above form you can see, two tabs. One is for Link and another for text. So depending on what you want to submit, select appropriately. Now let me take you to each field in details. 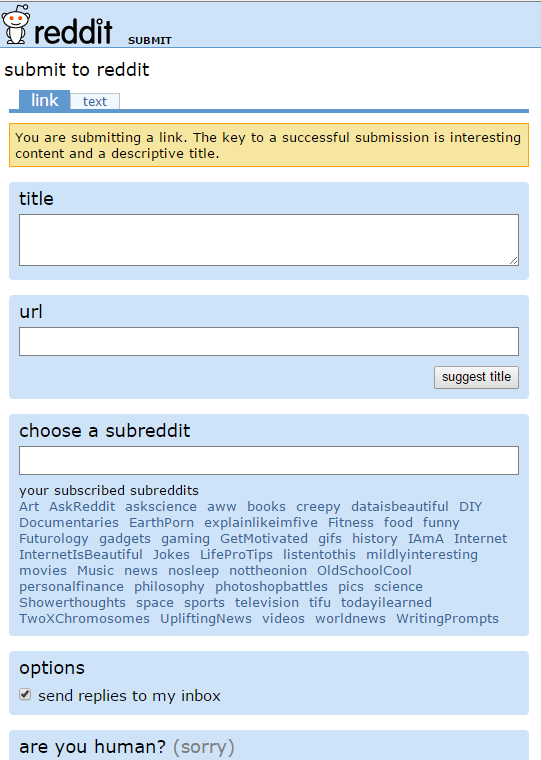 This is the most important part of Reddit submission as Reddit users decide whether to click on your link or not by seeing the title. So if you’ve an eye catchy and interesting title, you’ll rock else no matter what your content is no body is going to click on it. Write an interesting title which can force the Reddit users to click on your link and you can get lots of traffic. You must double check your title and see if this is fine or not. At the end of post, I will show you few most popular subreddit on Reddit and then you can get an idea which type of subreddit gets famous on Reddit. As simple the link of your content you want to share. But never ever use link shortener tool to short the link length to submit on Reddit. These are real people and avoid any type of spam. So no matter what your original url is, you must provide the real one. Another most important part. There are only limited subreddit available on the Reddit and this is the reason, Reddit doesn’t work great for everyone. Also, at the time of submitting the link, you’ll only see those subreddit available which you have subscribed. 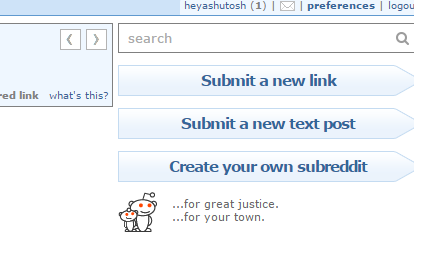 So out of available subreddit, you should select the one which suits your content very wisely. Below are the top 10 subreddit. These subreddits have maximum number of subscribers. So there is more chance to get traffic. As I mentioned earlier in this post, Reddit won’t work well for all the niches. 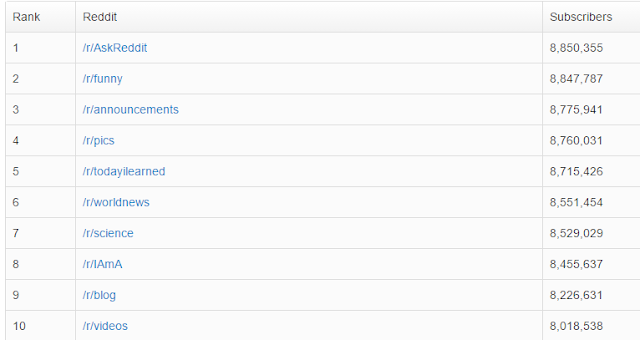 As from the above figure, those are the top 10 subreddit available on the Reddit depending on the subscriber. And the more number of subscribers, the more number of engagements you’ll find on those subreddit category. Here are the few categories which get maximum visibility and if you’ll submit these types of post on Reddit, you will get good traffic. 1. Infographic- A good subreddit for an infographic might be /r/TIL. Like other social media and social bookmarking sites, posting on Reddit on some particular time can give you maximum benefits. 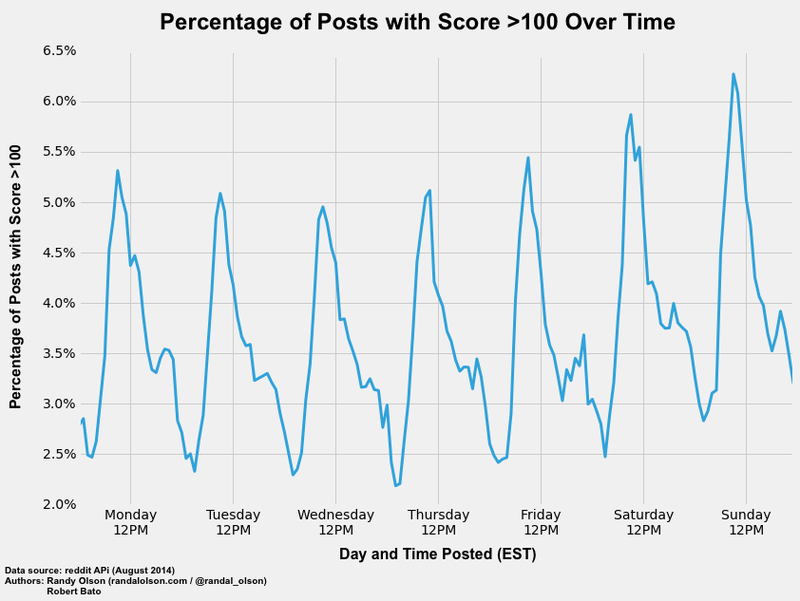 If you’ll analyze the posts on the front page of Reddit you will find that most of those posts have been submitted in some particular time interval. Randle Olson analyzed the timing of Reddit posts and he has depicted that in the below chart. Also while searching for the best timing, I found one site which analyzes the post based on number of votes and subreddit. You must check this site. It is Redditlater. I searched with 100 votes for /r/IAMA subreddit and found this result. • Save other’s link as favorite etc. And in return they will also do the same with you and by this way, traffic will increase. Have you tried any social media or social bookmarking site’s advertisement? If yes, what was your experience? DO let me know in comment. • Either you can buy ad which will show for all subreddits. This is the general kind of ads. • You can go for targeted ads like targeted location and subreddits. Once you will go for advertisement, your links will be shown at the top of the page and you will get lot of traffic and visibility. There are few things that you should avoid with Reddit else your account may get blocked also. Below I am listing some of the checkpoints which you should remember. • Don’t post same links again and again. 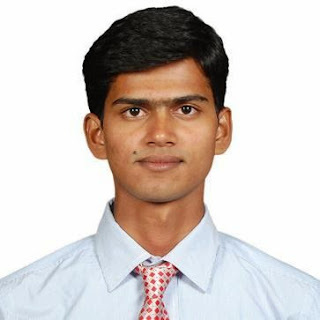 • Don’t use auto poster for Reddit like you do for Facebook or other social media. • Avoid posting very old links. • Don’t use Reddit for link building. • Submit your link only in relevant subreddit. As you are aware now that Reddit is great for driving instant and huge traffic. 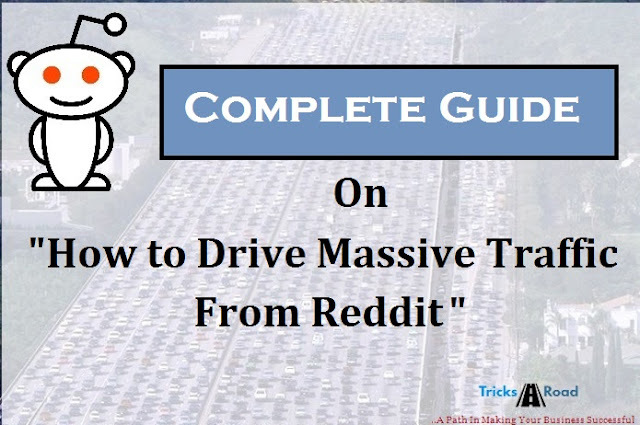 To drive more traffic I am following some extra steps which took Reddit traffic as the top 5 traffic source for TricksRoad. Below is exactly what I follow. • Write eye catchy titles. This is most important. • Up-vote, save as favorite and comment on other’s submission and in return they will do the same to you. • Avoid doing down-vote for any submissions. • There are several groups of Reddit users on Facebook and Google+. Join those groups and share your subreddits. Vote the group member’s subreddit on Reddit and they will do the same for you. This is one of the best ways to increase traffic. As promised earlier, here are the top 10 submissions of Reddit which got maximum up-votes. I am sharing this so that you will get an idea about which types of titles get most famous on Reddit. This trend is from 2013. Reddit is a great tool for internet marketers, bloggers, webmasters and business peoples. You must add this in your list. The best thing that I liked about Reddit is the right source of audience. While submitting your link, you will only see those subreddits which you have subscribed. So this tool will help you a lot in your marketing. I am sure if you'll implement these tricks, you can drive massive traffic from Reddit. Do you have any good experience with Reddit? Have you tried Reddit? Do share your stories with me.